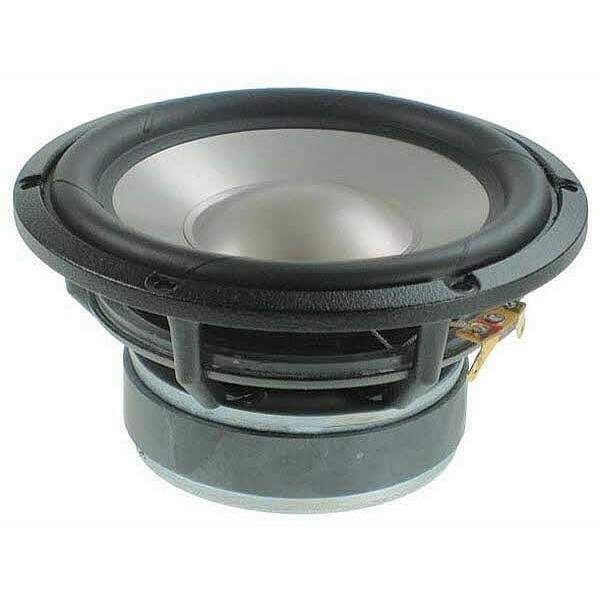 Seas L16RN-SL H1480-08 Woofer £64.50 excl. VAT. Linkwitz LXmini & Pluto Woofer. Stiff 5” aluminium cone, natural rubber surround. T-yoke, no edge resonances. An outstanding 5” High Fidelity woofer specially selected and designed by Siegfried Linkwitz and Seas for the LXmini and Pluto systems. Also suitable for woofer upgrade to Pluto 2.1 specification (please see SL website for equalization changes). Seas L16RN-SL H1480-08 Woofer is an outstanding 5” High Fidelity woofer with an injection moulded metal chassis specially selected and designed by Siegfried Linkwitz and Seas for the latest LXmini and Pluto systems, but capable of superb results in other designs. The stiff light aluminum cone and low loss rubber surround show no sign of the familiar 500-1500 Hz cone edge resonance and distortion associated with soft cones. A bumped back plate in the magnet system, together with the very long and light weight copper clad aluminum voice coil allow extreme coil excursion with low distortion. A heavy copper ring below the T-shaped pole piece, to reduce non linear and modulation distortion. The extremely stiff and stable injection moulded metal basket keeps the critical components in perfect alignment. Large windows in the basket both above and below the spider reduce sound reflection, air flow noise and cavity resonance to a minimum. This driver uses Seas SpiderRing® technology.